Son of Thomas Edward and Mary Jane Rose, of Chippenham, Wiltshire. Took off at 0009 from Downham Market on a mission to Mulheim. Last heard on wireless at 0235 when its position was plotted at 5210W 0320E. Presumed lost over the North Sea. Three bodies from those who died, came ashore and were buried in separate Dutch cemeteries. 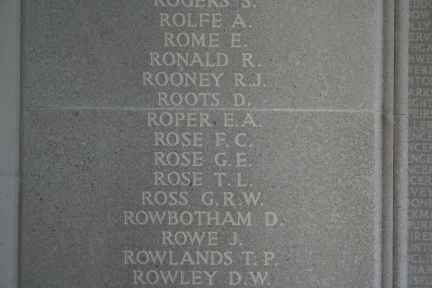 The others are commemorated on the Runnymede memorial. Sgt Cramm, who enlisted in Rhodesia in 1941, was a native of New Zealand, though his parents later emigrated to Canada.